Martha Berry thanks Marion Dame for her gift that will be used to buy additional farm land which will be worked by Berry boys to provide food at Berry for many years. 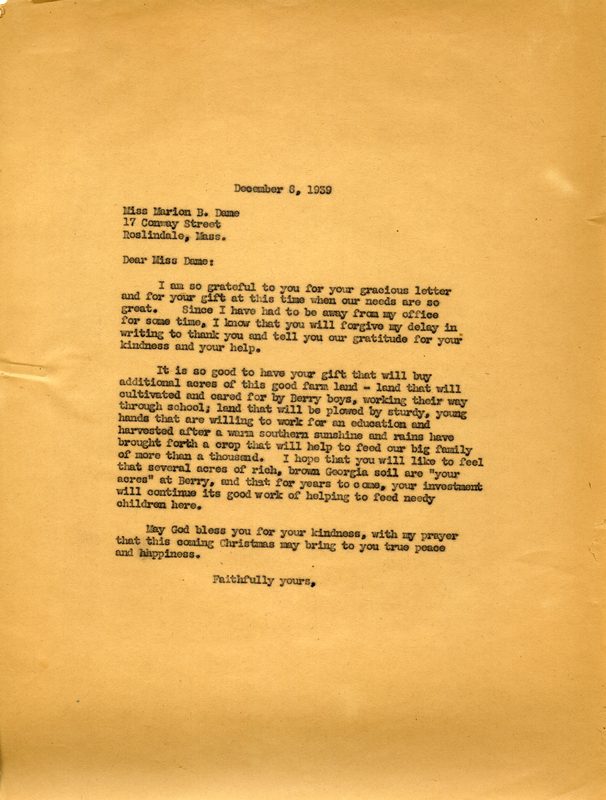 Martha Berry, “Letter to Marion B. Dame from Martha Berry.” Martha Berry Digital Archive. Eds. Schlitz, Stephanie A., Olivia Mund, Alan Henderson, Jessica Hornbuckle, et al. Mount Berry: Berry College, 2016. accessed April 22, 2019, https://mbda.berry.edu/items/show/14803.